Úvod - Extra-Sensory Perception - (07) Hubert E. Pearce, Jr.
Extra-Sensory Perception - (07) Hubert E. Pearce, Jr. In the beginning of his clairvoyant work, in the first 50 trials, Pearce got only chance average and rose very little above on the first 100 trials. But he kept on rising until very soon he had reached a level of 9 or 10 correct per 25 trials and has held to this average ever since—now over a year, and well over 15,000 trials—except in experimentally produced situations that definitely work against the E.S.P. capacity and a few other occasions (illness, etc.). Even including a lot of special experiments at which he was handicapped and including his one short ill period, his totals up to April 1, 1933, were 11,250 trials with an average of nearly 9 (8.9) hits per 25. Such results as this are positively breath-taking, when one calculates their mathematical significance. These alone sky-rocket the value of X up above 60, with odds against chance now enormous beyond our capacity to appreciate. This interesting experiment invites quite naturally a comparable one with a drug having the opposite effect—that of integration. We used caffeine for this purpose in 1-grain tablets of citrated caffeine. The effect of caffeine was tried on Pearce on five occasions, using 5-grain doses. The general aim was to give it when Pearce had been running low (hence the low pre-caffeine score quoted), since it has been caffeine's "de-fatiguing" effect that is most recognized. Under those conditions it raised his scoring very considerably. We may compare the records of work just preceding the drug-taking with those following for the experimental period. The data are fragmentary, due to the cutting-in of other experiments which were usually brought in as soon as the scoring level rose again. The results are summarized in Table XXII. 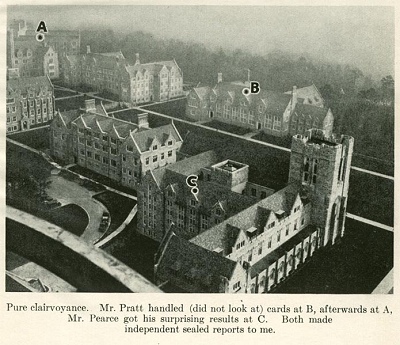 minute, Pearce, in the Duke Library, over 100 yards away, tries to perceive the card then " exposed" by Pratt. He has succeeded, magnificently, in doing so. At first he failed, as he nearly always does with a new condition procedure. But the runs mount as he goes, as follows: 3, 8, 5, 9, 10, 12, 11, 12, 11, 13, 13, 12. The total 300 at that distance average 9.9 per 25; X = 12.2 and excludes the chance-hypothesis. If we exclude the first three runs, as "adjustment phase" trials, regularly required for Pearce, we have an average per 25 of 11.4, which is higher than Pearce's level for B.T. at close range. In fact, in his B.T. 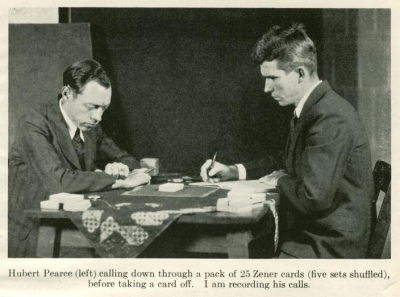 with the same technique, carried out in the same room with the cards but with the latter invisible—conditions the same as reported just above, except that Pearce was a few feet from the card instead of 100 yards—in 300 trials he obtained only an average of 7. This is lower than his usual average of 9.5 to 10, due in part perhaps to difficulty in adjusting himself to new conditions; this may be all the harder with the observer right in the same room than with him off with the cards 100 yards away. But, at any rate, distance does not matter in this mode of perception, so far as these results go to indicate. Then the cards were taken to the Duke Medical Building, with over 250 yards between cards and percipient. Again there was the low-scoring adjustment period at first. This lasted over more runs this time but was followed by good scoring, which is now going on daily at this distance. After a time the distance will be still further extended.